On this day 10 April 1994 (Exactly 25 years ago) The Super Eagles of Nigeria won their second Africa Cup of Nations title after coming from a goal down to defeat the Chipolopolo of Zambia at the Stade El Menzah in Tunis, Tunisia. This was one of the most thrilling encounters between Nigeria and Zambia since they first met in 1973. 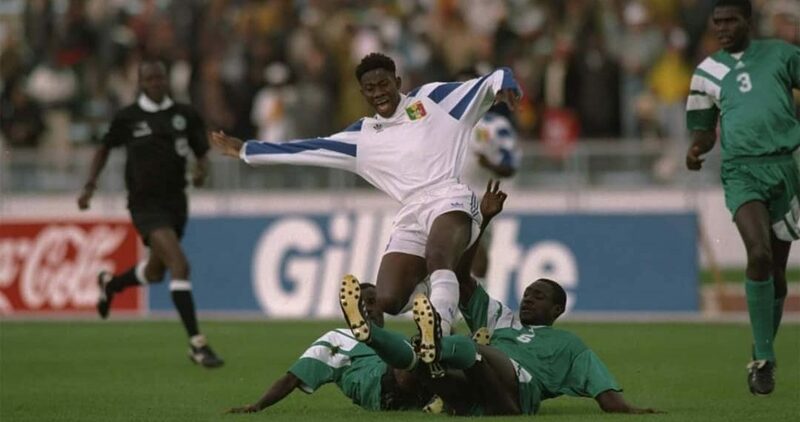 It was the first time ever both countries would clash in the final of the Africa Cup of Nations. Elijah Litana headed Zambia into the lead on just three minutes before Emmanuel Amuneke drew Nigeria level in the fifth minute. Just two minutes into the second half, Amuneke scored what proved to be the winner and sealed a 2-1 win for Nigeria’s second AFCON title. On 27 April 1993, the Zambian national football team were travelling to Senegal to play a World Cup qualifier when the plane they were travelling in crashed into the Atlantic Ocean, just 500 metres from the shore of Libreville, Gabon’s capital. All 25 passengers and five crew members on board were killed. The tragedy sent shockwaves throughout the nation, the ‘Chipolopolo’ (Copper Bullets) had beaten Italy at the 1988 Olympics and were eyeing their first ever World Cup spot, but were now gone. Yet less than a year later, Zambia’s re-built team made an incredible run to the the final of the 1994 Africa Cup of Nations tournament, just missing out to a superb Nigerian team, losing 2-1 in the final. “We played some of the best football in Zambia’s history in the second half of the match,” Zambian legend Kalusha Bwalya said. Later in the summer, the Super Eagles made their debut at the FIFA World Cup in the United States, where they defeated Bulgaria and Greece 3-0 and 2-0 respectively. Although they lost 2-1 to Argentina, they nonetheless qualified for the second round. A late collapse in their game against Italy meant that they fell short of the quarter-final place, but they made an immeasurable impact on the world of football and will forever be remembered for their beautiful playing style. On this day 10 April 2005 (Exactly 14 years ago) Kumasi Asante Kotoko posted a 5-4 victory on penalties over Obuasi-based AshantiGold to clinch the 2005 One Touch Gala competition held at the Accra Sports Stadium. Regulation time produced no goal. Kotoko who badly needed victory to please their expectant supporters converted their kicks through skipper Godfried Yeboah, Kofi Sammy, Francis Akuafo, Ali Quadrago, Osei Ababio whilst Ashgold’s goalkeeper Isaac Amoako saved Kenneth Ababio’s kick. Skipper Kofi Amoako, Shaibu Yakubu, Isaac Amoako and Daniel Asamoah scored for Ashgold whilst Joseph Jackson and Kwaku Wiafie wasted theirs.